Dean L. Mitchell was born 1957, in Pittsburgh, Pennsylvania and reared in Quincy, Florida.He is a graduate of the Columbus College of Art & Design in Columbus, Ohio.Mitchell is well known for his figurative works, landscapes and still lifes. 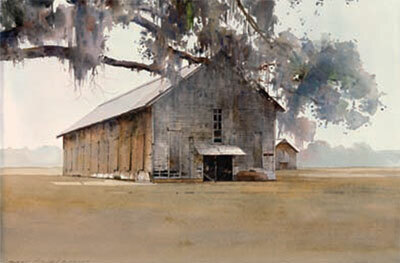 In addition to water- colors, he is accomplished in other mediums, including egg temperas, oils and pastels. Dean Mitchell, Southern Tobacco Farm, 20"x30"
Mitchell has been featured in numerous publications, including the New York Times, Christian Science Monitor, American Artist, Artist Magazine, Fine Art International and Art News. And he has won almost every major painting award in the country. In 1995 the U.S. Postal Service commissioned Mitchell to do a series of Jazz stamps. His art can be found in corporate and museum collections across the country, including: Nelson-Atkins Museum of Art, Kansas City, Missouri; Mississippi Museum of Art, Jackson, Mississippi; Saint Louis Art Museum, Saint Louis, Missouri; Kemper Museum of Contemporary Art, Kansas City, Missouri; The Autry National Center, Los Angeles; The Arkansas Art Center, Little Rock, Arkansas; Can- ton Museum of Art, Canton, Ohio and the Library of Congress, to name a few. Dean Mitchell has been named a “Best Bet” for collectors in ART news by R. Crosby Kemper Jr., founder of the Kemper Museum of Contemporary Art. To learn more about Dean Mitchell and to view his work visit www.hsvmuseum.org.com.